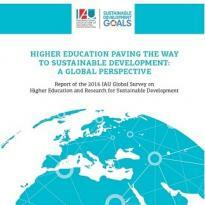 The IAU launches the report of its 2016 global survey on Higher Education and Research for Sustainable Development (HESD). With this publication, the International Association of Universities wants to underline the key role higher education plays in achieving the Sustainable Development Goals (SDGs). By sharing knowledge and promoting international cooperation, the IAU aims at supporting and inspiring higher education leaders to develop HESD strategies. The findings of this publication are based on an IAU survey conducted in 2016, in which 120 higher education institutions worldwide took part. The results underline that universities are involved in sustainable development and integrate it in their strategic development plans. However, there is still room for progress. In the publication, you will find inspiring sustainability initiatives undertaken by IAU Members worldwide. Get inspired and commit to the SDGs! Download the publication and share it with your networks!